Toshiba Mobile Display Co., Ltd. has developed a 7.0-inch low-temperature poly-silicon (LTPS) thin-film transistor (TFT) liquid crystal display (LCD) for vehicle-mounted and industrial uses that enables multi-touch input on the display screen without the need for additional installation of a touch panel as a demonstration of its new touch panel technology. The technology enables an integrated touch panel function by forming the display pixel electrodes and TFT within the LCD panel using LTPS TFT technology and creating a detecting circuit for electrostatic capacitance changes between the electrodes and the peripheral object. Compared to conventional LCDs with an external touch panel, the thickness is reduced by 57 percent to approximately 1 millimeter, the weight is reduced by 48 percent to 225 grams and the surface reflection ratio is reduced by 10 percent. Its smaller size enables the design of more compact products for mobile applications, reduces the impact on the environment by saving resources and power, provides crisp and clear images with minimal reflection of natural light even in a bright environment, and features intuitive multi-touch input. 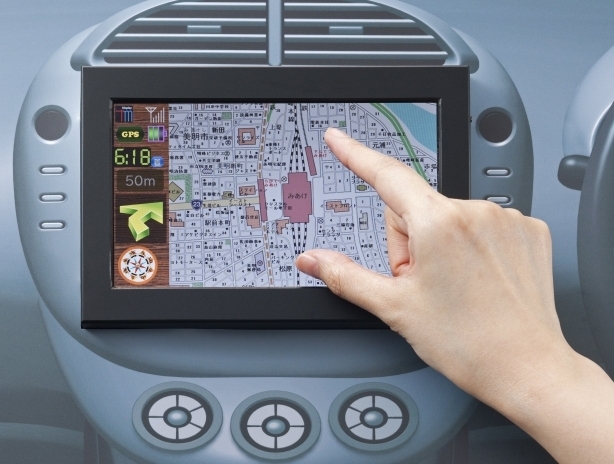 Recently, an increasing number of smartphones, cellular phones, in-vehicle car navigation systems, tablet-type PCs and other equipment for mobile applications have been designed around a capacitive-type touch panel1 integrated LCD, thereby facilitating the rapid spread of products that feature a low-profile and reduced-weight design, and intuitive, easy and simple touch input. TMD has developed this technology in response to the increasing demand for in-cell touch panel2 LCDs with the touch panel function integrated in the LCD panel for further reduction of thickness, weight and environmental impact. The capacitive-type touch panel is designed to form transparent electrodes on the touch panel and detect changes in electrostatic capacitance between the electrodes and the user’s fingers with high accuracy, thereby enabling the screen panel to respond easily to light finger touches. To integrate this feature in the LCD panel it is essential to suppress possible interference with various signals in the LCD panel. To address the problem, TMD has developed a proprietary sensor circuit, taking advantage of LTPS TFT technology. Specifically, an amplifier circuit is formed in the pixels to amplify the signals, which are then detected by the sensor for output, providing a configuration to precisely transmit sensor signals to the outside of LCD panel. This helps achieve consistent and fast-responding touch panel operation. This technology will be exhibited in the Toshiba booth #1119 at SID 2011 International Symposium, Seminar and Exhibition to be held from May 17 to May 19, 2011 in Los Angeles, Calif., USA. A touch panel detecting system which determines the location of the input touch based on the change in electrostatic capacitance between the user’s finger and the touch panel’s conductive layer. As the user’s finger approaches the touch panel, electrostatic coupling between the finger and the conductive layer changes, allowing detection of the location of the input touch. Existing LCD panels with a built-in touch panel have an independent touch panel mounted on the surface layer of the LCD panel as an independent separate component. The “in-cell touch panel” refers to the configuration with the touch panel function integrated into the LCD panel. It is commercially available in several designs, including one which incorporates an optical sensor to detect the finger images through an external or an internal light source, and another which detects electrical changes caused by pressing and deforming the two (2) glass substrates of the LCD panel. This newly developed product is based on TMD's proprietary design that enables detection of changes in electrostatic capacitance caused by a touch of the finger without additional installation of any light source for optical sensor or such larger pressing forces which deflect the LCD panel.